One diet. Multiple lifestyles. 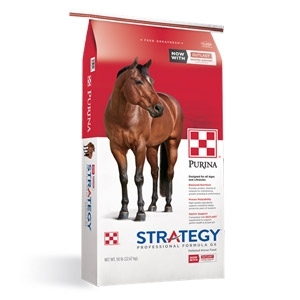 Strategy® GX Professional Formula horse feed is as simple and as complex as that. Simple, because the perfected-over-time formula provides 100% of the required protein, vitamins and minerals for a wide variety of horses in your barn, when fed as directed. * While there will always be individual horses with specialized nutrition and management needs, Strategy® GX meets the nutritional needs of the vast majority of horses with a single formulation. So even when your horses are in different stages of breeding or development and varying levels of performance, Strategy® GX delivers complex, balanced nutrition in a simplified feeding program.